Arlington, VA, October 17, 2016 – PBS KIDS, a leader in connected learning for children, today announced the launch of its first tablet: the Playtime Pad. 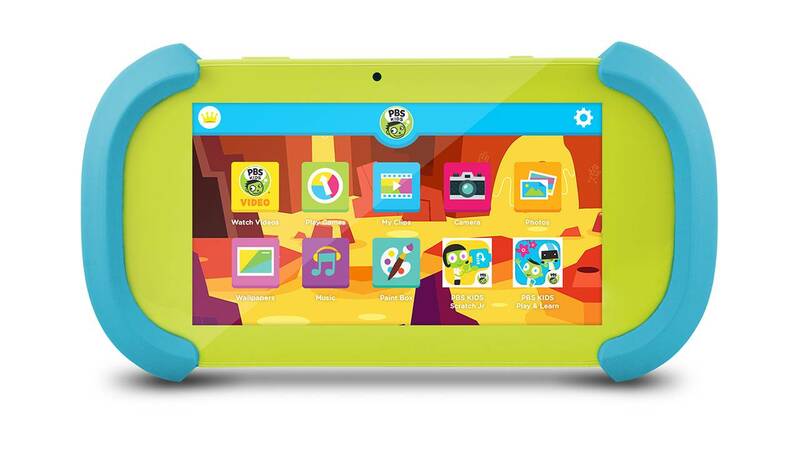 Produced by Ematic, the 16 GB kids’ tablet provides a one-stop destination for PBS KIDS’ educational content, with more than 25 games and 120 video clips and music videos pre-loaded, along with 100+ hours of video on the PBS KIDS Video App. Other popular apps such as PBS KIDS ScratchJr and PBS Parents Play and Learn are also included. The Playtime Pad features a front-and-back camera and a Paint Box coloring app that encourages kids to flex their creative skills. The tablet is kidSAFE® Coppa-certified, and includes controls that enable parents to customize the device for each of their children, set limits on screen time using a play timer and manage what kids can access. The debut of the Playtime Pad extends PBS KIDS’ work in the digital space, which includes a robust collection of content, such as more than 30 learning apps and the award-winning pbskids.org, which is the number-one individual site in the kids’ category for total videos watched as well as total minutes spent viewing desktop video.1 Last year, PBS KIDS delivered more than five billion streams across digital devices.2 Building on the many ways families can engage with PBS KIDS anytime and anywhere, the number-one children’s educational media brand will soon launch a free 24-hour channel and livestream delivered by PBS member stations, which will be accessible across platforms, including the Playtime Pad. One-hundred percent of the net proceeds PBS receives from purchases of the PBS KIDS Playtime Pad will support PBS KIDS’ mission to empower children to succeed in school and in life. The PBS KIDS Playtime Pad will be available starting November 6 at Best Buy stores and on bestbuy.com for $79.99, on walmart.com and on shop.pbskids.org. Ematic’s innovative approach to providing superior technology in portable media has continued to impress consumers since 1985. Built on a solid foundation of technological advancement, our commitment to premier quality and value has earned us the reputation of the top-selling brand at Wal-Mart, QVC, Radio Shack, Tiger Direct and other fine retailers. From eReaders to Android Tablets, Ematic offers a solid range of durable electronic accessories with an undeniably low price. Ematic was the proud manufacturer of the #1 selling kids tablet in 2015 in the USA (NPD). Designed in California, all of our patented products are customizable in a wide array of color options to suit your personal style. In addition to an environmentally friendly office approach, Ematic also supports the community by donating ten percent of our total profits to charity. 1 Source: comScore Video Metrix Aug ’16. 2 Source: Google Analytics Jan – Dec ’15. 3 Source: “Consumer Behavior and Preference Study for the Tablet Category assessing key content, brands, pricing and product features” by Marketing-Immersion; 1,000 participants surveyed.